Many parents help their children to enjoy all the benefits that a musical education can bring. However, there are also an increasing number of adults who either took lessons as a child and want to revisit music making after a hiatus or have never really played but have always wanted to. I have frequently made the observation that in all the many years that I have worked in music stores I have never heard one single adult complain that taking music lessons was a waste of time when they were a child. On the other hand, if I’ve heard one – I’ve heard fifty adults say that they wished they had learned to play as a child or wished that they had taken their musical education more seriously when they had the chance. Here are some benefits of learning an instrument as an adult. I think that one of the biggest advantages for an adult who learns to play is the relaxation and stress reduction that playing an instrument offers. Many adults have high stress or high demand jobs and playing music facilitates relaxation and renewal after a challenging day. It is quite nice to go home in the evening and just sit down and enjoy making playing the piano. It is such a dramatic change from the demands of the day that it is quite like the oft mentioned breath of fresh air. Other adults have the opposite need. They may work a mundane schedule and playing an instrument in the evening can give a little creative boost and joy to an otherwise lackluster day. Another possible benefit for the adult is the potential social component to playing music. People who have never played in an orchestra, band or combo don’t know what they are missing. Playing a song or composition is like creating a piece of art in the ether. The difference between note in the air and a canvas is that, unless we choose to record the music, the performance piece is ephemeral – it only exists during the moment that it is being performed. Now, if instead of just performing solo and you have other musicians in the mix, it is like creating art in a small community of friends and making music takes on a dramatic added dimension. Let’s call it a synthesis of music and ideas of two, three or a room full of people. Often, some of the best friendships that you can form will be with other like-minded musicians that you perform or practice with. I wound up marrying the lady I played music with, but your results may vary. Another bonus is the sense of accomplishment and satisfaction that you get from being able to play an instrument. It is a feeling that you have taken the time to develop a skill that frankly many people will be envious of. There is a sense of joy and fulfillment that you get while performing a piece of music, or even in making up something new out of your creative mind. Now, at this point some are rolling their eyes and saying, “I would never be able to make up a piece of music” but how do you know if you can unless you try. Some of the most popular and moving songs of all time are very simple three and four chord affairs. Try it, you just might like it. Finally, many find that playing music causes a boost in their creative juices that spill over onto other endeavors. One creative act can lead to another and who knows, tickling the ivories in the evening might just birth the inspiration that helps you with that sales presentation, desperately needed piece of computer code or new approach that helps you deal with that difficult or demanding customer, patient, client or co-worker. 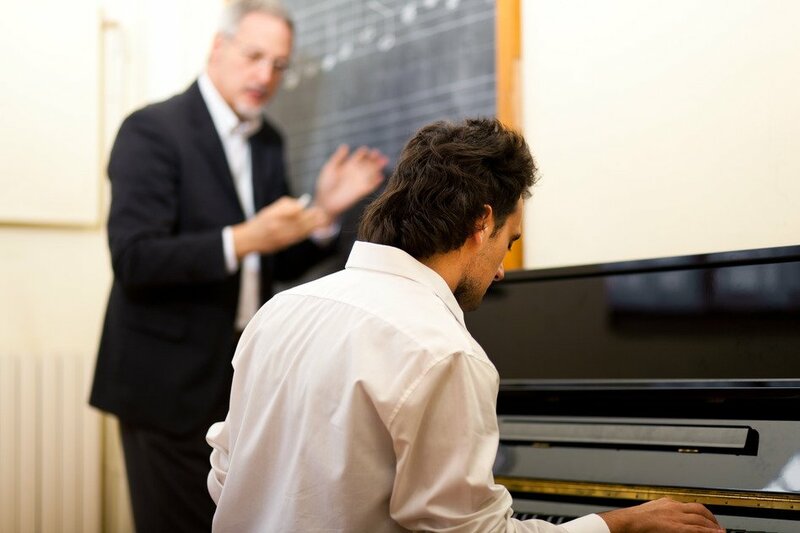 College students may find that playing an instrument during a break from studies with yield an increase in concentration and comprehension when studying is resumed. If you have some experiences that reflect the positive benefits of learning to play an instrument, we would love to hear them. I may add your story in our piano blog. Next post we will talk about the great things that come to kids through learning an instrument.